The requirement to maximise value for shareholders is at the core of any corporate investment or financing decision. The intrinsic value of proposed investments should be assessed before deciding how much capital to allocate; the benefits and risks associated with each available source of finance should be considered when capital is being raised; and capital, and any associated financial risks, should be managed in a way that continues to maximise value. At every stage, an analysis should be carried out to ensure the decision is optimal for shareholders and other capital providers. 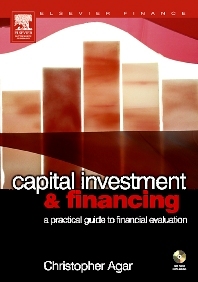 This book provides practical guidance on the application of financial evaluation techniques and methods (mainly covered in Appendices), as well as comprehensive coverage of traditional corporate finance topics, discussed in the context of capital investment, raising and management and financial risk management (using derivatives). Models, formulae and other quantitative techniques are illustrated in over 100 examples (using only basic mathematics). Capital Investment & Financing provides a comprehensive, in-depth coverage of concepts, methods and techniques involved when evaluating acquisitions and other investments, assessing financing opportunities, and managing capital. The core chapters provide practical guidance on key corporate finance topics; the Appendices contain more quantitative material, focusing on pricing techniques. Examples are used throughout, and an integrated case study (fictional) in the final Appendix uses many of the techniques discussed. List of Equations. Examples, and Exhibits. Preface. Chapter 1 - CAPITAL INVESTMENT: Introduction. Capital Expenditure on Tangible Assets. Acquisitions – an Overview. Corporate Valuation. Acquisition Structuring and Evaluation. Chapter 2 - CAPITAL RAISING: Introduction. Debt. Equity. Chapter 3 - CAPITAL MANAGEMENT: Introduction. Long Term Capital Management. Short Term Capital Management. Chapter 4 - FINANCIAL RISK MANAGEMENT: Introduction. Interest Rate Risk. Currency Risk. Appendix A Financial Ratios. Appendix B Pricing Techniques. Appendix C Leasing. Appendix D Examples. Bibliography. Index. Christopher Agar FCA MCT is an independent corporate financial consultant, having previously worked in corporate recovery (Price Waterhouse, now part of Pricewaterhouse Coopers) and the corporate finance department of an international telecommunications provider. He is a Fellow of the Institute of Chartered Accountants in England & Wales and a Member of the Association of Corporate Treasures.